Photo: Paul Quattlebaum House, ca. 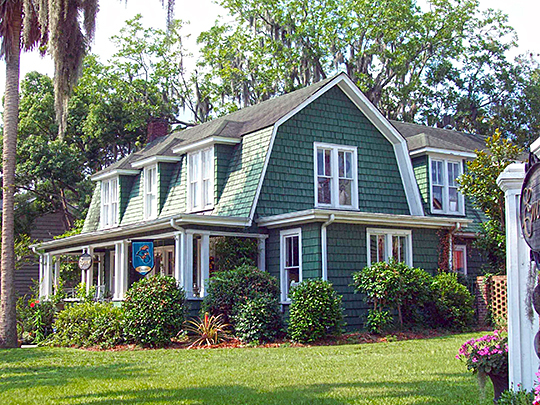 1890, 225 Kingston Street, Conway, SC. Listed on the National Register of Historic Places in 1986. Photographed by User:Pubdog (own work), 2010, via Wikimedia Commons, accessed January, 2013. Horry County administrative offices are located at 1301 Second Avenue, Conway, SC 29526; phone: 843-915-5020. Early surveyors found a wilderness that would draw fur traders, second sons of English nobility, and adventurous settlers seeking land. Many went seeking religious freedom. Those of wealth and consequence bought or were granted large tracts of land. As these settlers slowly moved into the Horry County area, then known as Craven County, some settled along the coast to fish the Atlantic Ocean and its inlets. As a result, the coastal fishing village of Little River developed and is one of the oldest settlements in the county. The fur trade continued to flourish but the naval stores industry and farming eventually became prevalent. In the 1700s and early 1800s, indigo was a major cash crop for the coastal area. The indigo was harvested from plants introduced to the area and from them a dye was made that was very much in demand in Europe. Several indigo plantations were situated along the Horry County coastline. Cattle and pigs were also important commodities in this area, just as they were throughout early coastal South Carolina. From the earliest days of Horry County's history up until the latter half of the 19th Century, the naval stores industry was prominent in Horry County. The seemingly inexhaustible supply of pitch, pine tar, turpentine, and a variety of other naval products supplied many Horry County citizens with the majority of their income until the industry tapped out all of the natural resources needed for the production of naval stores and moved southward in the late 1800s. Kelly Lee Brosky, Horry County Public Information, A Historical Look at Horry County, www.horrycounty.org, accessed August, 2013.